Salman Khan has taken a simple idea, YouTube videos that explain math, and transformed it into the future of education. I’m just going to come out and say it: the Khan Academy is the best thing that has happened to education since Socrates. The brainchild of Salman Khan, the Khan Academy became famous by teaching simple math lessons for free through over 2000 YouTube videos. Now, after millions in donations and an expansion of the company, the academy is so much more. The website for the Khan Academy already had exercises you could use to test your understanding of the videos you just watched, but in the past few weeks the website has exploded with wonderful new features. You can create a profile for the site simply by logging in through Google or Facebook. You can track your progress with some wonderful metrics. Teachers (or ‘coaches’) can monitor student progress in groups. Students can earn badges to keep them interested. The list goes on and on and it’s all free. Free, I tell you! In true Khan Academy fashion, Sal explains these new features in the video below. As they continue to expand beyond math, and increase the sophistication of their platform, I am left with little doubt that the Khan Academy represents the future of education. And it’s already here. The impact that the Khan Academy could have on the classroom is enormous. As Sal discusses in the video (8:10) they are already performing trials to see how teachers can use the KA platform to improve the way they track and help their students. With the Khan Academy, teachers would “intervene only when a student is stuck.” In other words, the KA is supplementing the education paradigm in such a way that teachers are only needed as corrective influences. They’ll be tutors more than lecturers. Imagine that shift occurring across the board, not just in math. The Khan Academy already has great videos on history, the sciences, finances, even venture capital! They are still expanding their exercises, and we should eventually see them outside of math as well. If there’s an objective way to present or evaluate a concept, chances are that Khan Academy could include it. All the lessons of traditional school, maybe even those that involve writing, could be there one day. Yet such an expanded role of the Khan Academy would be so much more than just a movement of school to the internet. It would also allow for a profound transformation. Students can pause videos, rewind, replay, and research hard to understand concepts with the Khan Academy in ways they could never do with a human lecture. The KA software can generate nearly infinite number of exercises to test a student’s skills. It can track their every success or failure in ways that human teachers never could hope with 30+ students in their classrooms. As I mentioned before in previous discussions on digital education, the biggest difference is that this sort of online platform puts the pace and path of learning firmly in the hands of the student. Work at your own level, learn concepts in the order that makes the most sense to you. Learn when you want to learn, how you want to learn. And do it all for free. Free! How frakkin’ beautiful is that? Students all over the world, young and old, can learn anything for the cost of internet access. It’s a beautiful time, people. The Khan Academy's new metrics are available once you create a profile. 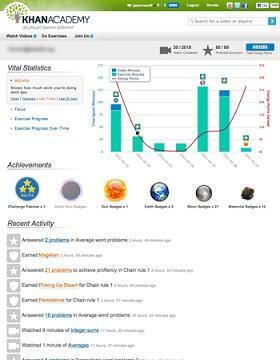 Tracking students is easy, and students are encouraged to learn more by earning badges. And we’re only getting started. You can tell from all this expansion that the Khan Academy is making good use of the $2 million that Google donated to the site, and the untold contributions from the Gates Foundation. Their lead designer, Jason Rosoff, is doing great work with the interface and the presentation of the analytics. Ditto for developer Ben Kamens. Judging from comments made by Khan, Rosoff, and Kamens, the Academy is only going to get bigger, better, and more refined from here on out. Let’s not forget that the Khan Academy isn’t alone in this digital education revolution, either. We’ve seen other another math site, Mathletics, that has many of the same features as the KA software but that adds in global competition to the formula. Maybe KA will adapt that as well? Hopefully so. There are dozens of other online learning sites (many require a subscription fee, but not all) and the genre is getting stronger and more diverse everyday. There are real chances here that the Khan Academy, and others who follow their example, will push education into an era that is more flexible, reactive to students’ needs, and open to everyone. That’s not to say that everyone is taking advantage of the opportunity. Although the Khan Academy has million of views, and thousands of users of its software, it and its peers have a long way to go before reaching a statistically significant percentage of the global student population. But, you know, they are gaining ground fast. I love going to Chartbeat and watching the KA statistics in real time. The great thing about this academy and its platform is that it can spread almost as fast as the internet itself. There are no guarantees, of course. As with any new venture, digital education has its hurdles to clear. Security is paramount with any service used by young children. The KA, Mathletics, and other sites already do a good job with insulating their users, but undoubtedly they will be tested as their populations expand. Funding for the Khan Academy is excellent at the moment, but growing into the sort of universal online education system that they could become will require more than a few million dollars. There are huge areas of education, especially writing based skills, that will prove very difficult to automate. Not impossible, considering the progress we’ve already seen with AI writing, but a major challenge to be sure. This is all assuming, clearly, that the Khan Academy will want to expand in such a way. If they don’t, though, someone else probably will. I think the Khan Academy’s example will prove powerful enough to attract other entrepreneurs and philanthropists to the cause of free global digital education. With enough visionaries, it could happen. If/when it does, the world will never be the same. In fact, I’m almost certain it will be considerably better. My secret hope is that by the time I have children, and they are ready for school, they will be among the first generation raised in the new paradigm of digital education. Godspeed Khan Academy. You have a few years, but keep up the hustle.